If you've been using Twitter through its website, I recommend that you use a desktop client instead to further enhance your tweeting experience. 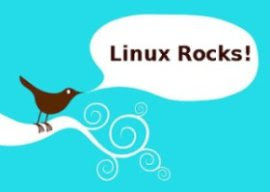 Since Twitter has become immensely popular, there are tons and tons of available desktop applications that support this great micro-blogging service. So I'm here to assist you on narrowing down the choices, and hope to somehow give you an idea on picking the one that suits you best. 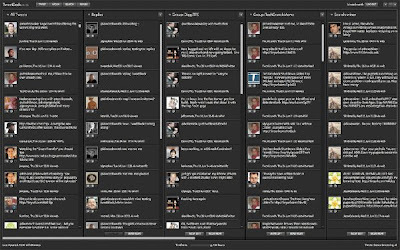 TweetDeck is my preferred Twitter desktop client right now because of its rich features and well thought out interface. It is ideal for those who have lots of friends and followers (I don't have much so follow me HERE :-) since you can split the application into columns making it possible for you to group things up. TweetDeck can be easily installed using Adobe Air. I used twirl for quite some time before, and until now I can still say that it's one of the best Twitter clients out there. It has a great number of features like image posting, tweet search, changeable theme, spell-checker, ability to record videos on Seesmic, and plenty more. Like TweetDeck, twirl also runs on Adobe Air. Gwibber is an open source Twitter client for GNOME desktop environment. It is developed with Python and GTK and supports other social networking services like Jaiku, Identi.ca, Facebook, Flickr, and Digg. To Ubuntu or other GNOME-based distro user who wants a lightweight Twitter client with basic functionality, then Gwibber is for you. 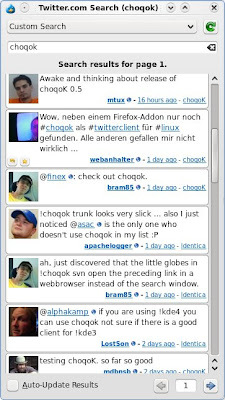 For KDE users, Choqok is the one Twitter client I can highly recommend. I know the name is hard to pronounce, but don't get discouraged as it has good amount of features like Twitpic.com integration, ability to notify user about new statuses via KNotification or Libnotify, KWallet integration, and more. 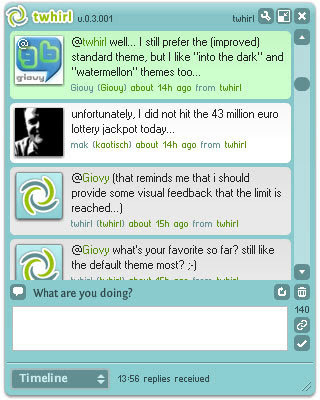 Spaz is an open source Twitter client with cool looks and features. 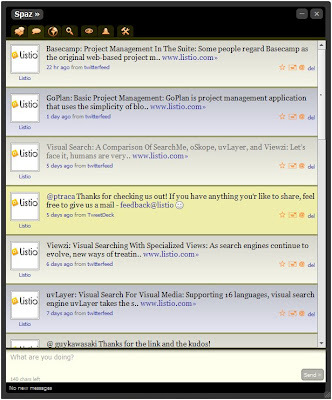 What I like most about Spaz is its support for user-created themes and it's built-in global search function. Spaz is also dependent on Adobe Integrated Runtime (AIR). I hope you have made your choice already. If you have time for a little adventure, why not also try tweeting via the Linux command line (terminal). UPDATE: I forgot to mention that you can also use Twitter via Pidgin. Thanks for your blog. Read it daily and it's been very helpful and informative. I was thinking about what I could use for identi.ca and this solved it. 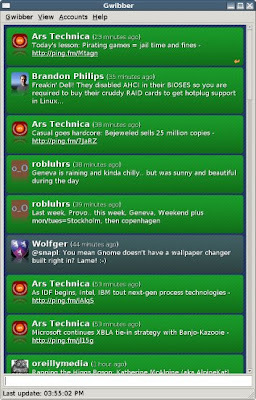 KDE (4.2) also has a twitter widget. Not exactly a Linux client per se, but since most Linux users are also Firefox users it's worth mentioning the Firefox extension "TwitterFox" [http://www.twitterfox.net] that puts a Twitter client right into the browser. I just tried the KDE4.2 widget mentioned here and like it, its pefect for my needs. Chokoq is good too, does everything and then some but for pete's sake can we stop with the stupid names? Something that sounds like 'choke c**k' might mean something in another language but when you have a bunch of giggling pre-teens and friends in the house, it gets old very quickly. Now I see there is a FF extension (3.5? ), gonna have to try it too. Didnt have one Twitter clien before this article, now Im gonna have three. If you use the latest developmental version of gwibber you'll find it has a lot more features. Pretty much anything twhirl can do it can do...and it integrates with a gnome desktop a lot better! TTYtter is a great command line client. I use it on low-power machines.